You may think of a broken arm as a problem that only athletes and active youth have to deal with. Well, think again! Anyone can suffer from a broken arm at any time. If you move, you’re at risk. A slip in the shower or a fall on the sidewalk is all it takes to cause significant damage to your bones. If you have a broken arm that means you cracked the bone. There are three major bones in your arm that may crack. These are the humerus, or upper arm, and the radius and ulna, which make up the lower arm. In addition to a fall, a broken arm can be caused by trauma, such as getting hit in the arm or a car accident. Step 1: Stabilize your arm by creating a sort of sling. This can be made from a towel, a t-shirt, or any large piece of cloth. A sling is created by wrapping the fabric underneath your arm and securing it behind your neck. Step 2: Use ice to reduce swelling and pain. An ice pack or simply a bag of ice may work. If you use a bag, be sure to put some sort of cloth between it and your skin. Otherwise, the skin on your arm may get too cold. Step 3: Go to your local FastMed Urgent Care to confirm the diagnosis of a broken arm and get medical treatment for it. 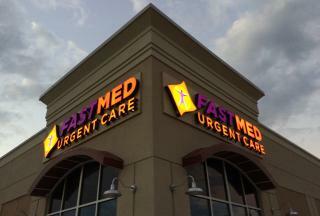 At FastMed, the wait time may be significantly less than the emergency room, so you can get treatment and relief that much sooner. With certain types of medical conditions, it may be tough to know when you should go to Fastmed and when you should visit your local emergency room. This handy chart can help. As you will see, the medical professionals at FastMed can handle injuries like broken bones, fractures, and sprains. We encourage you to follow FastMed on Facebook to learn more about our medical services and to get excellent wellness tips right to your News Feed.